Australia has a special system of health cover for international students in Australia. This is called Overseas Student Health Cover (OSHC) and, with the exception of students from very few countries, you are required to have this for the duration of your student visa in Australia. OSHC provides a safety net for international students similar to that provided to Australians through Medicare. OSHC costs depend on how long you will be in Australia. Premiums vary depending on the health fund but generally, they start from A$78 for three months insurance (A$320 a year). If your spouse and dependent children are accompanying you to Australia, you will need to pay a family premium. You pay your OSHC premium before coming to Australia. 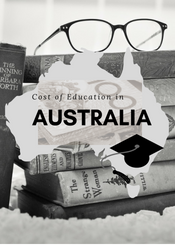 How to cope with the Cost of Living in Sydney Australia - A Fresh Student's Guide Australia has been a home of both native and international students because of the good quality of education. Though, today the cost of living in Australia might be burdening to some. Sydney particularly has a moderately high cost of living, and it is just a justification of its being one of the best cities in the world. But apparently, Australia's total cost of living is a little lesser than that of the United States and the United Kingdom. Students flock in Australia especially in Sydney since universities here offer a good range of programs with degrees that are recognized internationally. And the cost of living can affect them in several ways. These students had to go with the Australia's world class living too. But to those who want to save a lot, they surely are looking for ways on how to cope with their life in Sydney. Here are some things to note on how students can cope with the cost of living in Sydney: Check your expenses. The first thing to do is to list all the things that you need to pay within a month or a week rent, gas and electricity bills, phone bills, etc. Rented apartment ranges from $100 to $500 weekly and is cheaper when you shared it with someone else, say a classmate or a friend you are going to the same school with. Gas and Electricity, on the other hand, range from $10 to $15 if you share accommodations. Add your total monthly and weekly expenses and put aside your budget for that. Initially a shared apartment, electricity, gas and telephone, could add up to at least $1,500-$2,500. You may also add to these expenses your monthly haircut which ranges from $20 to $100 and your monthly medical consultation which cost $30. Buy only necessities. You can have a grocery list before going to a supermarket to be able to take account on what to buy beforehand. It is also good to bring cash that is just enough to buy those on your list, so you'll not be tempted buying things that you do not need. Get part-time jobs. Sydney offers a good number of part-time jobs for students. Work in a convenience store or in a gasoline station in your spare time. That will give you more money to spend or save. Cut your vices. To save more minimize your natural cravings say on cigarette and alcohol. You may also want to cut your movie watching habit if you go to cinema almost every week. Movie tickets range from $13-$15 nowadays. Always use your student discounts. Student discounts are always available for many goods and services. You can lessen the cost of services like riding on a bus which cost $15. Save and cope with high cost of living successfully. But, remember, do not always refrain yourself from enjoying. You may take a good break from saving and reward yourself a good meal at a high-class bistro. Balancing everything will make your life in Sydney worth it!